The SEC shows how the toxic twins turbocharged the housing bubble. Democrats have spent years arguing that private lenders created the housing boom and bust, and that Fannie Mae and Freddie Mac merely came along for the ride. This was always a politically convenient fiction, and now thanks to the unlikely source of the Securities and Exchange Commission we have a trail of evidence showing how the failed mortgage giants turbocharged the crisis. That’s the story revealed Friday by the SEC’s civil lawsuits against six former Fannie and Freddie executives, including a pair of CEOs. The SEC says the companies defrauded investors because they “knew and approved of misleading statements” about Fan and Fred’s exposure to subprime loans, and it chronicles their push to expand the business. 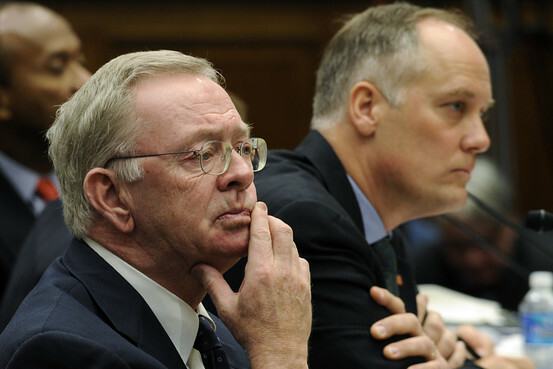 Associated Press Former Freddie Mac CEO Richard Syron, left, and former Fannie Mae CEO Daniel Mudd during a Capitol Hill hearing in December 2008. The SEC fingers the government-backed mortgage buyers, not Wall Street greed. The Securities and Exchange Commission’s lawsuits against six top executives of Fannie Mae and Freddie Mac, announced last week, are a seminal event. For the first time in a government report, the complaint has made it clear that the two government-sponsored enterprises (GSEs) played a major role in creating the demand for low-quality mortgages before the 2008 financial crisis. More importantly, the SEC is saying that Fannie and Freddie—the largest buyers and securitizers of subprime and other low-quality mortgages—hid the size of their purchases from the market. Through these alleged acts of securities fraud, they did not just mislead investors; they deprived analysts, risk managers, rating agencies and even financial regulators of vital data about market risks that could have prevented the crisis. In the U.S. mortgage crisis and the European sovereign debt crisis, bad policies subsidized bad investments. EXCERPT FROM THIS ARTICLE: The reason prosecutors can’t prove criminal intent is that in many cases the bankers were simply trading in compliance with the regulations governing them. It wasn’t just senior executives at Wall Street firms who failed to understand the numbers and how bundling subprime mortgages would undermine value-at-risk measures. The same was true for the lawmakers and regulators who created the problem. Rep. Barney Frank, who last week announced his intention to retire from Congress, will be remembered for his comment in 2003: “I want to roll the dice a little bit more in this situation towards subsidized housing.” He got what he wanted: By 2008, half of the 54 million mortgages in the U.S. were subprime and other low-quality loans. The instant spread of information in financial markets means that policy mistakes are reflected quickly, globally and sometimes signaling trillions of dollars in regulatory mistakes. But our system is so complex that it now takes actual rocket scientists to measure the risks. The era of big regulation is over. Or is it? President Obama took to these pages yesterday to announce a new executive order to restore “balance” to federal regulation and root out rules that impede job creation and economic growth. If he means it, this will be one of the great policy walkbacks in American history. The rest of us should stay in a Missouri state of mind. 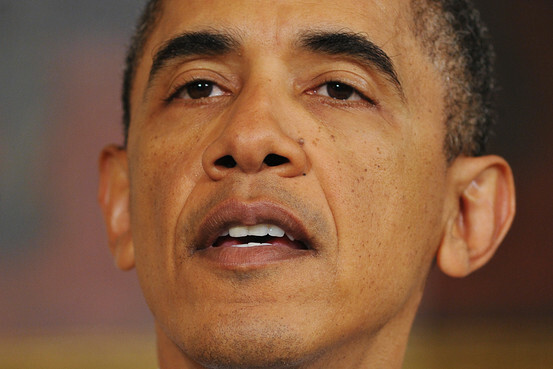 Substance aside, Mr. Obama’s new order is a significant symbolic concession. The White House is admitting that after an historic voter rebuke due in part to its regulatory overkill, it must show some willingness to pull back the throttle. The President is gradually conceding the conservative and business critique of his first two years, even if the concessions so far are mostly in style and rhetoric. The real test will be how Mr. Obama defines “unreasonable.” The executive order he signed yesterday instructs federal agencies to weigh the costs and benefits of proposed rules and choose the least burdensome alternative. Yet that merely reiterates an executive order President Clinton signed in 1993 and that was supposed to be governing the Obama Administration all along. Mr. Obama also ordered a “retrospective analysis” of all rules to streamline or repeal the damaging ones. By making it harder for companies to go public, Congress and regulators tilt the playing field in favor of the wealthy and well-connected. Facebook raised $500 million last week, but the only people who could invest were the wealthiest private clients of Goldman Sachs. Instead of offering shares to the public, Facebook chose a private version of a public offering. The case of an unsocial Facebook should be a wake-up call about how regulations have undermined public markets. Facebook’s customer base could not be more mass. The site is used by some 600 million people around the world. It got almost 9% of all Web visits in the U.S. last year, more than Google. According to comScore, a majority of all Canadians have a Facebook account. Tens of thousands of its internal documents will be exposed on Wikileaks.org with no polite requests for executives’ response or other forewarnings. The data dump will lay bare the finance firm’s secrets on the Web for every customer, every competitor, every regulator to examine and pass judgment on. The steep fiscal crisis that many states face includes staggering retirement costs for their workers, estimated at some $3 trillion in unfunded future promises. The size of those liabilities has already shaken up some municipal bond investors, and the inadequate, sometimes misleading way that states account for these steep costs has attracted the attention of the Securities and Exchange Commission. A new proxy access rule will help activists and unions, not shareholders. The Reaganites who came to Washington in 1981 used to say that “personnel is policy.” Flash forward to 2009 at the Securities and Exchange Commission, where Chairman Mary Schapiro handed senior roles to former union pension fund officials and last week rewarded such funds with more influence over corporate America. With another of her patented 3-2 party-line votes, Ms. Schapiro has given the big pension funds a power they have never had—the ability to force their preferred candidates for board directors on the proxy ballots that public companies must send to shareholders. Shareholders who have owned 3% of a company for at least three years will now be able to nominate candidates who would represent up to 25% of a company’s board. Until now, pension funds and other dissident shareholders had to pay to mount their own campaigns and mail their own notices to shareholders. But the pension funds rarely did so because they would have had to justify spending their beneficiaries’ assets with evidence that their activism was actually increasing the value of the investment. Not likely. Sold in the name of “shareholder democracy,” this new rule will mainly be used not by mom and pop investors, but by union funds and other politically motivated organizations seeking to force mom and pop to support causes they otherwise would not. Under the new rules, average shareholders won’t muster the numbers to influence corporate elections. The Securities and Exchange Commission is busier than ever in the wake of the financial crisis and the most significant financial legislative changes since the 1930s. 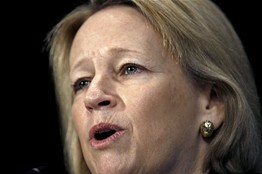 So it has been more than a little puzzling to watch SEC Chairman Mary Schapiro stake out another partisan position on a peripheral issue called “access to the proxy.” On Wednesday this rule was approved: Shareholders will now be able to place their own nominees for corporate boards directly on the company’s proxy card, at company expense.